We Can Now Offer Tungsten Heavy Metaling To Change V8 & V6 Crank Assemblies From External To Internal Balance For Reduced Stress And Greater Reliability For Higher Output Engines. 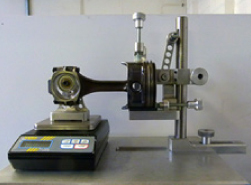 In-House Precision Engine Component Balancing Service Now with CAA Approval! We Can Balance Any Kind Of Engine, if it is one we have not balanced before, balancing will take an extra day as we will need to manufacture a drive mandrel for it. The Swaymar Marine Engineering Ltd balancing facility features state of the art computer technology, capable of balancing even the most complicated V8 or V12 crank assembly down to an incredible 0.1 gram. 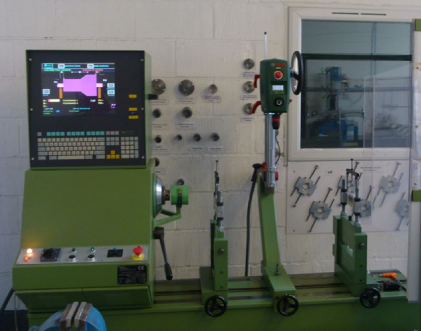 Swaymar Marine Engineering Ltd now offer a standard turnaround on balancing of 3-4 days; however if urgently required we can turn round in 24 hours. If our customer is travelling some distance or there are other special circumstances, we can by appointment balance while you wait. (it should however be born in mind that this can take several hours, precision balancing is a complex process). Establishing big end weight of connecting rod prior to balancing the crank assembly on a special fixture for when pistons are “press pin fitted” to the rods, to eliminate the possibility of damaging them by removal and refitting. Different engine configurations need different techniques to ensure perfect balance, and this is where our expertise counts, we balance to very much tighter tolerances than the industry standards. A combined experience in the internal combustion engine industry, of over 80 years has taught us one thing, “...to get Perfection you must do it yourself” all our balancing is done in house by our technicians. 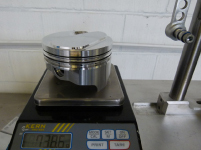 Pistons are the very easiest bit, (providing you know where to take metal away without weakening the piston), as they exert a purely reciprocal force on the engine, and it is simply a case of making sure that each piston, pin, circlips & piston ring assembly weigh exactly the same. The crankshaft, flywheel, drive plate, front pulley and timing gear come next, for this you need a machine (see photo) this assembly has a pure rotating moment with no reciprocal components at all. it is balanced by spinning the assembly in ball races mounted in carriers connected to incredibly sensitive strain gauges which can detect the slightest out of balance down to ¼ of a gram, it is a time consuming but fairly straightforward procedure if you have the machine. 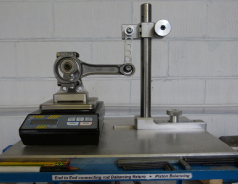 the only tricky bit is that some engines require special adjustable counterweight assembly’s (which we have) attaching to the big end journals to simulate a % of the piston and rod weights, arrived at by certain formulae dependant on engine type. Lastly, and assuming that all the above is perfect, this is the really tricky bit that can make the difference between an average engine and a superb one, the connecting rods. Most manufacturers (and even some engine specialists) simply machine them to the same overall weight and say “good enough”. The secret to a superb engine is to understand that a connecting rod is a very complex item when it comes to having an effect on fine balance. The small end of the rod has a moment that is pure reciprocal with NO rotating moment at all. the big end of the rod is pure rotating with NO reciprocal moment at all. Rotating moment has the biggest effect on the crankshaft assembly. it can therefore be seen that it is quite easy to have a set of rods that despite being exactly the same overall weight, all the big ends are different weights, and all the small ends are also different. Having investigated the very few machines on the market that address this problem, (and not being too impressed with what was available.) Swaymar manufactured their own (see photo) the small end support incorporates no less than 8 miniature roller bearings to ensure as near a frictionless support as possible, while the big end is supported on a large roller bearing which is in turn supported on 2 more smaller roller bearings pressed directly into it. with this piece of equipment we can end to end balance connecting rods down to 1/10 of a gram. Please note that while our core business is geared towards performance enhanced marine engines, we can undertake balancing of anything using conventional piston engines. This includes light aircraft piston engines from the little VW based flat 4 engines through to the big Lycoming flat 6 type, most motorbike engines, and any form of automobile racing engines from historic and classic right through to current engines. 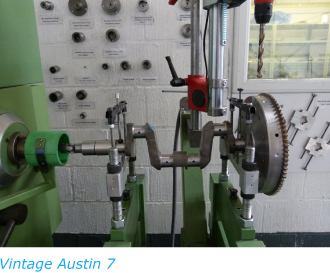 Our machine will handle most crankshafts from single cylinder right up to straight 8 or V16 engines. © 2014. Swaymar Marine Ltd. All rights reserved.